Nakakakan na po kamo ning Kaluko? 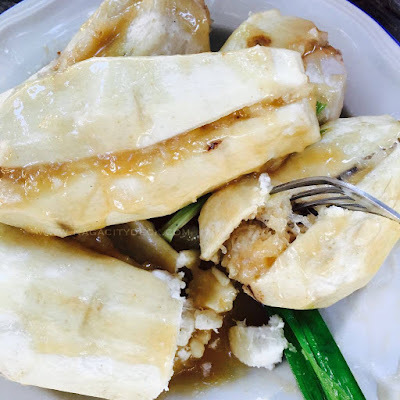 Kaluko is a local delicacy that I also recently discovered in Catanduanes last March. Searched for it in the internet and found that is also commonly cooked in Rapu-Rapu, Albay. It's true that you have to travel around Bicol just to discover more about Bicol's best. Peel gabi and cut it into halves lengthwise (make sure that you will know their pairs). Try to grate the middle portion of gabi (gently for it will smash easily). Combine the grated portion of gabi with the grated coconut meat together with half of brown sugar. Place the mixture back to the gabi and attach one to its pair. Cook it with coconut milk and the remaining sugar for 20 minutes.